Group of 12 from Ohio had a great time sharpening our tennis skills and enjoying the Ranch. Meeting Mr. Newcombe was a bonus - nice guy. Pro’s were super friendly and gave great instruction. Thank you for your compliments and taking the time write a review. It was an absolute pleasure to host your crew here at the Ranch and we hope you all will make it a yearly tradition! The price you found is 26% lower than this hotel's average rate of $85/night. The price you found is 11% lower than this hotel's average rate of $95/night. The price you found is 12% lower than this hotel's average rate of $76/night. The price you found is 30% lower than this hotel's average rate of $73/night. The price you found is 16% lower than this hotel's average rate of $96/night. The price you found is 23% lower than this hotel's average rate of $180/night. The price you found is 13% lower than this hotel's average rate of $91/night. The price you found is 59% lower than this hotel's average rate of $207/night. I'm way behind schedule posting this review. I attended the 5-day adult camp in March, and brought along two 16-y-o boys who attended the junior camp during their spring break. In the late 70's, I learned about Newcombe's Tennis Ranch, and always wanted to come here. After not playing tennis much over a 20 year period, I finally got started again a couple of years ago. So, I fulfilled a 40-year dream by coming to the Ranch. There were 60-70 juniors in the camp that week. The best thing for the boys was all the court time. They had about 30 hours of court time, just a week before starting their high school tennis season back in Wisconsin. The campers spend most of their time in drills, games, and match play. If you think they're going to get individualized instruction/essons; you'll be disappointed. That's not how it operates. You can get private or small group lessons that are geared toward improving your strokes - but the camp is more about fun and competitive court time - not about instruction, per se. I'm only telling you this to help you shape your expectations. The adult camp had about 12-14 people in it. Sometimes they have quite a few more, sometimes not. It was a good group of people to get to know and hang out with. Newk's tries to have one instructor per 4 campers. This ensures lots of hitting and not much standing around. No one complained about not enough court time. We got to know many instructors during the week - with Hunter leading the group eaach day. Weston was also there almost all the time, and many of the others filtered in and out of the adult group throughout the week. Director Chris interacted with us a bit, but not in an instructive capacity. He runs a great camp, and keeps things running smoothly. We got lucky. This was one of the few weeks out of the year when Newk was actually at the Ranch. On day 4 we got to meet him, listen to him talk about his old competitive days, and ask him questions. And of course, a photo opp. For me it was a real highlight of the week. Several of us took a Newk's bus into Gruene, Texas for dinner at the Gristmill on one of the nights. We had a great time with good food and Texas hill country music. The week wasn't even over when I started to plan when I could make a return trip to the Ranch. Thank you for your review on the Ranch.It was great to have you here. I remember both of your sons from Wisconsin very well and they were both very good players and a pleasure to work with, I am sorry that you feel like they did not get any individualized instruction. I spent time with each of them working on their kick serves and we gave chalk talk/strategy sessions every day to begin the clinic. Obviously, we need to do better in this regard but we do pride ourselves on giving incisive instruction, match play critiques and individualized sessions. Thank you again for your great review and we look forward to welcoming you back soon and please give my best to your sons. Hope their tennis is "rock solid." My 12 year old son and 10 year old daughter have spent two weeks at Newks each of the last two summers. Even though they were beginners, the staff made them feel comfortable and placed them in groups with similar skills. They both advanced in their skill levels and had a great time doing it. They both go on and on about one of the main administrators at Newks, named "Fossil" Phil. He's a very high energy, engaging guy who personally greets campers and families at the front gate as they arrive for drop off. I can't say enough about how Newks has helped teach my kids the game of tennis. My younger brother went to Newks back in the late 1970's and raved about how awesome it was. Apparently not much has changed, except Newk's housing and tennis facilities have grown and expanded since then. Thank you for your compliments on our camp and for taking the time to review your experience! We hope your family continues the camp tradition every summer! I've just finished the 5-day adult program at Newks and can't say enough good things about it. It was a bit of last-minute decision, hence I went by myself, which made me a little nervous. Within a few hours of booking, my phone rang and the cheery voice of Chris, the program director was on the other end. I immediately felt welcomed and gone were any feelings of trepidation. I feel that the ranch provided a very unique atmosphere, in that you almost feel as if you're part of a big family for a few days. The pros ate with the guests at every meal, and provided much insight into the ranch, the vicinity and tennis in general. Newks should be exceedingly proud of the pros in its employment. They were professionals first, but always showed a sense of fun. They were unfailingly polite and respectful. They displayed a genuine interest in each and every guest. One would be hard-pressed to find such a group of outstanding young people. Of particular note, a group of guests were driven to a local restaurant, The Grist Mill, by a few of the pros, which was such a great suggestion and a wonderful treat. Thank-you, Adrian, Price, and Dave-- I really enjoyed getting to know you better. I can't not mention the other pros as well, since they were all outstanding: Thank-you, Hunter, Weston, Tyler, Jack, Liza, Kelly, and I hope I haven't missed anyone! With regard to the tennis instruction, I found it to be just the right amount and variety of drills. I picked up up many helpful tips during the week and was able to incorporate many of them into my shots. This was the third tennis camp we have visited, the others being Vic Braden in St. George Utah and New England Tennis Holidays in Sugar Bush, Vermont. Overall it was a good experience and we improved our game. The staff was motivated and attentive. The facilities were good as well. We decided we would stay off campus as we were not convinced by the website about the quality of the accommodation and the food. In hind-sight, we should have stayed there as the food was really quite good (and there were lots of healthy options). We did not see the rooms, but i am sure they are fine. On the "room to improve" side, I would have liked to have had a session with the head coach the first day where we discussed my objectives and established some priorities. the beginning of the week felt a bit aimless for me as a result of the lack of such a discussion. to the credit of the excellent head coach, he responded very well to my concerns and I left a happy camper. Overall, this is a good place to go and we would consider going again. It was good value for money. New Braunfels itself, on the other hand, was quite a disappointment compared to our experience in Vermont where there were wonderful things to explore and fabulous places to eat. 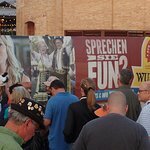 Particularly unfortunate was the Wurstfest, which we have re-named, the Worstfest. Visions of excellent artesian sausages, craft beer and interesting music danced in our heads. Instead there was mundane food, Coors light and and an endless series of oompapa bands. Thank you so much for reviewing us. We appreciate you taking the time. It was great to meet you and help work on your game! I am sorry we didn't get that chat at the start, and was glad we were able to have it at the end of the first full day. Sounds like we needed to have that chat about good recommendations in New Braunfels too.I am assuming you got my 2 voice mails when you returned home. This is the call where we chat about your game, and any questions before you come in. I remember leaving a second voicemail when I hadn't heard from you the week before your program. If I may recommend leaving us a cell phone number where we can get in touch with you. I know you and Sherry had been braving the national and state parks before your stay, and were therefore not home when I called. Short of this, you now know we are very accommodating, so you are welcome to ask at any time, any request and we will do our upmost to fulfill for you. Just returned from a week at the Tennis Ranch. It was an exceptional week of excellent instruction. Strengths: individual attention, high quality feedback, consistent positivity. I also greatly enjoyed watching the Academy Students who were inspiring in both their abilities but also in their total acceptance of a bunch of 3.5 to 4.0 over 50's watching their drills. Food was delicious and plentiful. Chris, Weston, Hunter and Eric all were dedicated to the task at hand of improving the play of a foursome of very average players. I went with my 78 year old dad who has never really taken a lesson and he had a great time. I definitely will return. I also enjoyed side adventures to New Braunfels and Austin. All other camps were super expensive, this one is super reasonable and extremely worth the money. Thank you for taking the time to compliment our tennis programs! It was awesome to have you and your Dad here. I love that you guys can get away to play together & take a vacation! It was a pleasure meeting you both. Your father had lots of great advice for me & the pros. Many fascinating conversations of lunch!